This page is dedicated to the trucks that can't be here today. They put in their more than generous share have hard work, and hard play. 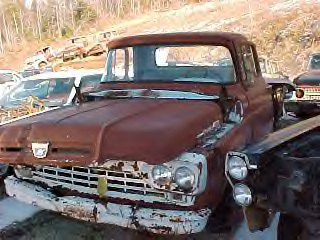 These old trucks are retired now, and some are never going to experience that again. We pay our respect to these great machines, as they forever rest in peace. What has this truck seen? Where has it been? It might still have a chance of being restored. It doesn't even look that bad. It's sad to see history rot away and even be crushed like this. This truck is in even better shape. 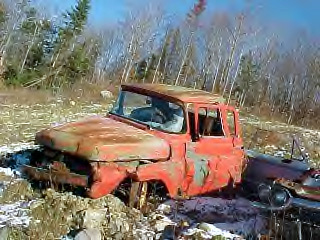 It was for sell as a parts truck, but it is restorable. To bad though, that this is going to go into the crusher, and will never live again. If I had the money and the time, I would buy these trucks, just so they could have a chance. This is real hard for even me to bare sight on. This once a man or woman's ride to the prom dance is slowly decaying. This one doesn't have a chance. It's just broken down and awaiting its fate. You can't even tell what year it is. However, it has to be a 57, or a 58. Look at the hood. But you see a 60 grille in the bottom right corner. 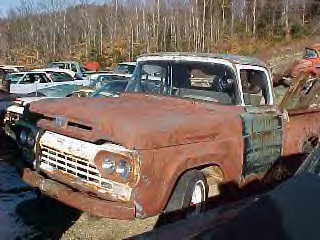 Maybe the truck was a 60 with a 57-58 hood. We will never know.